The Literary Garden is a place to relax and learn all at once, this is why we wanted to invite more people to join the club. When Cookies in the Courtyard was just around the corner, we were all thrilled because we wanted to be able to share our love of the garden with other students. With such little time to prepare, we had an amazing outcome. Although the crowd was not huge, we pulled in new members of all different grades. With our kind words and personal experiences on one poster, our social media accounts on another, and a table full of candy and garden pillows, we managed to have a whole list of new members interested in the Literary Garden Club. On top of everything, we were able to come together for the first time as an executive board to represent our love and commitment to the garden. As a board, we decided that our main goal for the year was inclusiveness. Not only are we striving to expand our club, but we are also hoping that the garden gives people a place to be themselves. When asked to describe their experiences in the club, members wrote about how the garden was a place for learning as well as a place to relax, bond, and have a group of people to call another home. It’s unbelievable to believe that the school year is almost here. We are looking forward to all of the activities for the year. 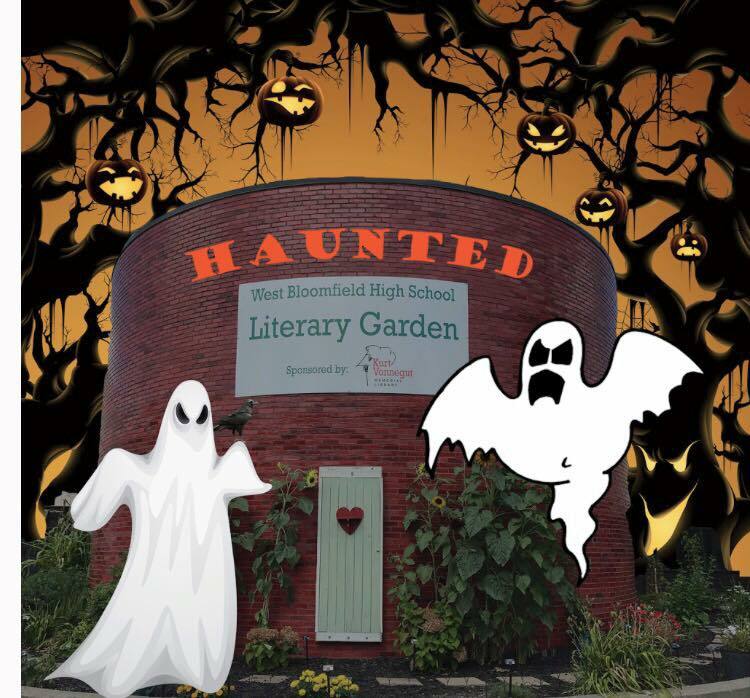 One of our favorite activities to plan and host is the WBHS Haunted Literary Garden. This is a way to celebrate Halloween with a spooky literary twist, so mark your calendars for Friday, October 12th from 7-10 PM. ENTIRE summer due to construction. On the bright side, McQ was finally able to access it and was welcomed by a beautiful and overgrown jungle with sunflowers being the center of attention. This year is going to be amazing. We hope to grow our garden and the list of authors in it. I am looking forward to an extraordinary year and I am so glad to be able to call the Literary Garden Club my second home, because of course, there is no place like home. This obviously is not your ordinary garden, and it isn’t just because it is connected to literature. This garden has been built on passion and love and support and hope, and it has established a community of people who are kind-hearted and understand the amount of work that has gone into the garden to make it possible. It has somehow transformed itself into a safe place, a zone of serenity and peace where everyone can come together and help each other with our everyday lives. This garden is made up of authors and novels, but it is also made up of students and a teacher who have given up their time to educate people and show them how books written hundreds of years ago have topics that are still relevant today. The garden to me is a happy place that holds a different meaning to each member, and I think that is extraordinary. The Literary Garden Club didn’t even become official until this year, and yet somehow we have the most genuine members I have ever seen. All of us have discussed this before, but it seems as if every member is not here to put the club on resumes for college applications; each member wants to be a part of the club because the garden has spoke to him or her in some way. Personally, the garden has shown me how little things can make such a big impact. A flower can inspire a world-renowned piece of literature just as easily as words you say to another person can make or break their entire existence. It has shown me how to cherish these little things in life and to try and understand how everything, good or bad, has impacted me and my growth throughout high school. Leaving this club as a senior is bittersweet. Yes, I was a part of the founding class, taking all the surveys and being a part of every discussion. I have helped to build the club to what it is now and I know it has so much potential that I hate to leave it. However, I know for a fact that McQ and the students are full of incredible ideas on how to expand the club, and I am beyond excited to see what they do in the future. This hardworking group can pull off anything they put their minds to, and I am so proud to say I belonged to this club. So, what does the garden mean to me? The garden means hope and love, it means connecting people through common interests and common struggles. The garden means passion and support, growth and reflection, but most of all, the garden to me means family. I have never been in a club where people have so much love for each other, and the little family we formed is something I will always remember. Izzie and Maggie, our fearless leaders, showing off our hardy little Harrison's yellow rosebush. This beauty originates from Emily Dickinson's home in Amherst, MA, and may date back to the poet's time there.